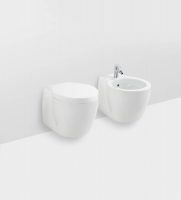 Tecma proudly presents its latest marine toilet: a new design of the wall-mounted Evolution toilet and bidet with the same proven concept as the Tecma Evolution. The ceramics have an updated sleek design to give a new style to the proven top-quality ‘wall hung’ solution. “Our customers deserve the attention and dedication of the Italian design. For us it is an ongoing process of perfection. The new Evolution is a step forward on this process in terms of styling, performance, reliability, and comfort” says Gianluca Silvestri, Business Unit Manager of Thetford Marine. With a fast, easy and reliable installation, the Evolution toilet and bidet is an ideal solution to save floor space and offer maximum hygiene. The new Evolution is equipped with the improved 2nd Generation System which means which means an optimized hose system. A safe air admittance valve is integrated to prevent syphoning, backflows and installation constraints. The soft closing seat and cover and the silent macerator make the Evolution the perfect combination to have on board.